That was not so long ago despite all the debate since, and I don’t think much has changed, except some feelings have turned out to be well founded. I didn’t anticipate the anti-Scottish stance taken by politicians and the media, or its effect on perfectly normal English voters. Scotland and the Scots have become targets for malice and demonisation, with myths about grabbing English money supported by comments on the rather better use made of that money by Holyrood. Well, it’s not English money, since Scotland is a net contributor to the UK economy. Scotland without oil would no doubt look far healthier than England without the City but politicians and those in the pockets of power will always be selective with the facts and figures they use to create ‘information’ – and in turn, opinion. It’s over 25 years since we moved to Scotland and we felt we had journeyed another decade or two back into the past then. 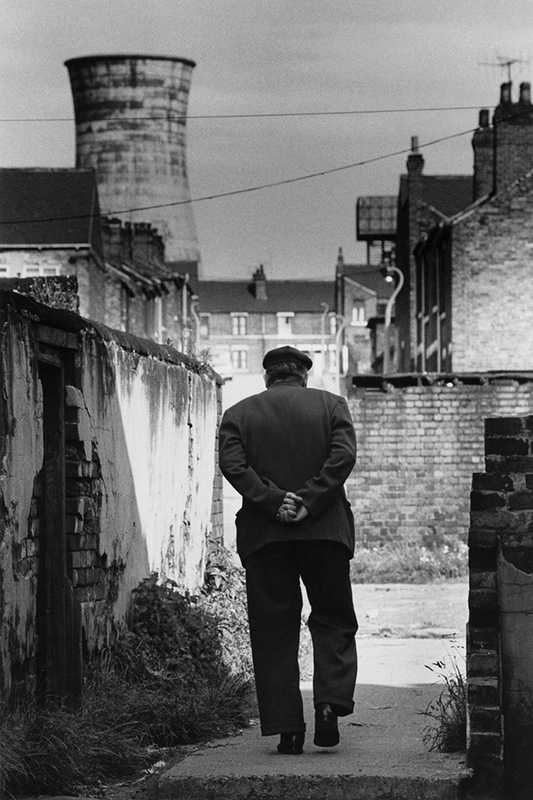 Now the voices of England I hear on television street interviews seem to have come from the 19th century, as if the country has turned to look backwards, to before the rise of democratic socially responsible governments, let alone all the progress which has happened during my own sixty-plus years. I’m worried that if you turn the political clock back this way the next step will be regression in tolerance, freedom, fairness and everyday human values. 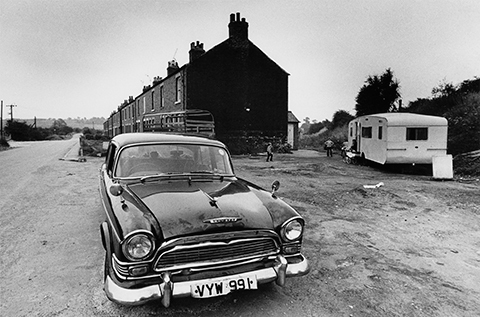 Would it be better to break up the UK into smaller federated country and regional units – devolved or otherwise – than to break it up by divisions of class, ethnicity, income, health, education, and enfranchisement? 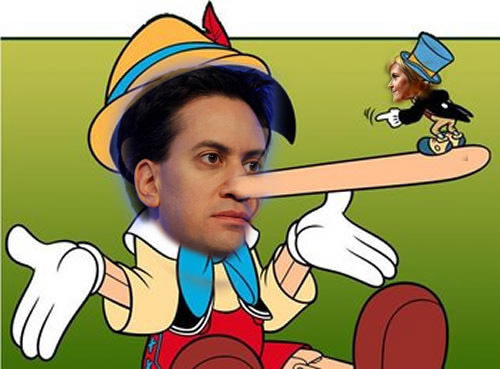 Can the SNP become Labour’s conscience? The talk on the eve of polling is of a progressive alliance – SNP, Plaid Cymru, SDLP, and Greens supporting a Labour government and giving Miliband a backbone rather than just ‘backing’. The alternative to a progressive solution does indeed seem to be a regressive one. It’s sad to hear so many people swallow the line that welfare, benefits and services existing for the social good and lifetime security of us all are at the root of excessive borrowing, deficit and debt. In fact, they are at the root of a society functioning at all. Every pound which goes from the Government (the taxpayer, you and me, all of us) to someone who can’t otherwise be housed, keep warm, have enough to eat and stay sane and healthy is not a pound which somehow disappears. What happens to it? It’s not put into savings – and the only way that money becomes inactive, and ceases to produce further wealth, is when it’s saved today. Banks can barely pay interest, or earn anything from moderate interest, leaving a personal and small business finance sector which depends for much of its viability on charges, fees, commissions, unsecured high interest payday loans, credit card interest and so on. Above that level you’re into the City, tax-free leveraged gambles on the stock market, hedge funds and high frequency computer trading none of which actually does anything except extract money through the cyclical creation of losing and winning positions (the loser is probably you, even if you don’t know it – and the winner is someone you will never know at all). I’d say that every pound carefully invested, saved, put into a pension pot or kept under the mattress is a pound’s worth of problem for the economy. Cameron and Osborne made no reference to that when changing pension rules to free up some of that frozen cash, but they must have had it in mind. In contrast, money spent on social housing, welfare, unemployment benefits when needed, child care, education, health, transport, infrastructure, protecting the disabled and looking after the elderly returns immediately to the economy. It pays for the employment of others and for the goods, services and energy needed. Even if it does end up mis-spent on cigarettes or alcohol it’s going right back into the active economy as those industries don’t simply hoover up the money and stick it in a vault. They too employ people. Even gambling keeps the cash recycling, however much you dislike it. To keep an economy thriving, people must spend money. Not just the middle classes or the top toffs either, as they are more likely to spend on luxuries and imported goods. Money must be spent on essentials and everyday life, including the maintenance of social environments whether city suburb or village. That’s where the continued ‘austerity’ really falls down – it reduces too many people to a state of economic hibernation. I’d argue that working folk I have seen on TV saying things do seem better now, the economy is turning round, austerity is working (and so on) show signs of habituation to changing conditions. It’s now been so long since they really were well off that they see their reduced circumstances as normal. I have seen this happen in business myself and understand the process; gradually, you accept less, and expect less. It’s even easier in daily life. You work longer hours, you change your shopping habits, you stop doing as many things for fun, cut down, simplify and keep going. Some call this process ‘sleepwalking’ into a different situation and it’s not a bad description (also applied to the erosion of civil liberties and the acceptance of corporate impositions on civic society). So, I reckon Nicola Sturgeon and the progressive minor parties – slightly to the left of centre, and not in any way extreme – have it right when they call for an end to austerity and especially an end to the purposeful impoverishment of sections of society which need financial support. It’s support to survive, not support to enjoy some ‘benefit’ others don’t, and pretty much every pound which goes to this support returns immediately to society in general and it is spent – it pays bills, it pays councils, it pays shops, it pays carers, it pays nurses, it pays teachers. And guess what happens to those pounds? Yes – they in turn pay their bills, buy their services, their goods, employ their staff. And it keeps on. The truth is that ‘trickle down’ has never worked but fuelling a domestic economy from the bottom up does work. As for higher taxes on extreme wealth or income, both now causes of problems and not signs of a healthy economy, they can in theory return money to active circulation which would otherwise disappear from the UK or be locked up for a lifetime. Ending austerity and increasing public spending, perverse though it may seem, could restore the UK to economic and social health and make us a happier and more secure nation. Scotland in general, and the SNP as the current chosen representation for many thinking Scots, grasps this idea rather well. I just hope that that greed, envy and malice don’t prevent England from working with Scotland (and Wales, and Ireland) towards the betterment of all people of the UK and downfall of the present shiny, happy Westminster kleptoplutocracy. Great powers went to work against the unthinkable possibility of an independent Scotland. 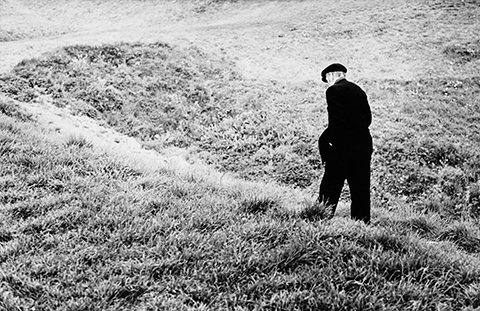 It seems, from promises made, that they stopped considering it unthinkable. However, in the aftermath an interesting prospect arises. It seems that England – and clearly not England as a single lump, but England divided into large regions comparable to Scotland or Wales – may be given ‘Devo Max’ too. Instead, in the grand of tradition of departments in pre-revolutionay France or the English shires before Henry VIII booted out the abbots, each region will become a tax-farm responsible for the oppression of its own peasants and the extraction of dues to be remitted to London. The myth will be that London is the place which creates the wealth, and hands it out to the devolved provinces. The reality will of course be that London is the place which takes the wealth, keeps the lion’s share, and returns substistence rations. Certainly London will provide defence (an army has many uses), communications and transport while exacting the charges and tolls needed to make every last strand of fibre optic cable, every metre of tarmac or rail, not only pay their way but provide a good profit. How else, after all, can this end? What David Cameron hints at can only, ultimately, result in Westminster and the City becoming a state in itself. It will have a relationship to the several parts of the United Kingdom rather like the relationship of Brussels to the whole of Europe – an administrative enclave which accrues to itself a hundred thousand salaried sinecures, which governs, regulates and taxes but does not actually make or do anything. Underneath this pinnacle will be the rest of pyramid, the devolved regions, the counties, cities and boroughs and at the very base supporting the lot will be the people. What more could Westminster and the City want? What better outcome for the whole of the UK, to be blamed in years to come on the temerity of the Scots to think they could take a parcel of these islands, call it a nation, and govern it without the control of Whitehall and Westminster? Of course, this is all just uninformed fantasy and speculation. None of this will happen. Wait and see! I’m feeling deeply ashamed of the British media. I’m worried because I’m reasonably well-informed and spending too much time on the whole Yes/No Scottish Referendum question, and what I’m reading, seeing and hearing makes me sad and slightly angry. I was trained in 1970-71 as a journalist, a ‘junior reporter’ at first, followed by three years on the staff of the Sheffield Star culminating in the 1974 NUJ lockout and the fist-fights witnessed in the newsroom between largely left-wing team on the evening paper and the right-wing staffers of the morning Sheffield Telegraph. Despite these battles between individuals worse for the traditional journo’s liquid lunch, and extreme debate between the rest of us who stayed sober during working hours, standards of journalism in print never slipped. If you reported a speech or a conference, your words were limited to those spoken at the event. You did not, like the Daily Mail, editorialise in a news report by providing your own adjectives (‘petulant’ used to describe Alex Salmond’s perfectly calm, complete, measured and accurate response to BBC questions, in the Daily Mail). I appreciate that UK newspapers have always been partisan, always been easily bought, and that falling sales make them extremely vulnerable to withdrawal of tenuous trading partnerships. This, between the BBC and the Mail, is something different. It seems that we have a government and media marching in step into an Orwellian future – not of course the future Orwell would have wanted to see, but the worst outcome of his satirical and cynical imaginings. Orwell wrote about a future deception of all people by all governments, the transition from the party line to the party lie, to the government lie, the continental lie and ultimately the global lie. Some would argue that we already see the global lie at work, that there’s nothing but one great conspiracy orchestrating false flag attacks, provoking wars, engineering plagues and enslaving humanity. Personally I think we’re at least a generation away from that and it’s all nonsense. But these recent days of the Better Together campaign to apply blunt instruments with force to the will of Scotland’s people show that we have a United Kingdom government prepared to lie, to conceal, to misrepresent, to coerce, to bribe, to undermine. This is worse than disheartening. It’s not a country I want to live in. I need to be able to trust government, or to be armed with knowledge to deal with deceptions pragmatically – not to be duped myself, but to accept the need for duplicity. When I became a journalist it was driven home to me that my job was to expose this, not to become a propaganda vehicle, and to base all reports on verifiable facts or literal quotations fully attributed. I might use an emotive word in a headline, as a sub-editor, but if you studied the story below you would find it was not MY word. It had been said by someone, noted down, quoted in the story and was legitimately borrowed (sometimes even with quotation marks) for headline impact. I could only call someone angry if they were clearly angry, said they were angry, or were accused of being angry. I could not describe a measured and polite, quiet speech as a ‘rant’ let alone ‘extraordinary’. I could not make up ‘facts’ on one hand and call actual facts ‘lies’. We didn’t see this kind of thing even in the Winter of Discontent or in Thatcher’s assault on the economic power of industrial labour. Something is terribly wrong here, standards have fallen. Time, then, to raise a new standard – a blue one with a white cross – in a new country with old values still at its heart. Scotland as an independent nation will have its mismanagement, its scandals, its financial predators, its successes and its failures but at least it will start on higher moral ground won by defeating this barrage of orchestrated mendacity. One day England may be lucky enough to make a fresh start too. Please don’t oppose Scottish independence because you envy it, and should Scotland achieve it in the face of this assault, don’t feel guilty just because you live in a country which tried its utmost to avoid this tiresome change. Scotland won’t abandon you. We will leave footsteps in the snow, markers across the quicksands of the future, for the time when change is the only option for the rest of Britain. And there won’t be border guards or a Travelex branch at Carter Bar. Don’t turn ‘don’t know’ into ‘no’ – be honest! Are there ever circumstances where you should forfeit your vote – don’t use that polling card, stay at home? Yes. The Scottish Independence Referendum presents exactly that situation. A normal multi-party, or even two-party, election is an occasion which demands as many people use their vote as possible. For one thing, each ward or constituency is electing just one one member of a larger representative body. The fairest distribution of opinions may be achieved by a high turnout – by everyone weighing up the various candidates or parties, and making a choice. In Scotland, of course, that can mean making multiple choices and it’s even fairer than the old Westminster first past the post system. This is one reason why Scotland has such an effective parliament. But this is NOT an election. This is a train heading for a set of points in the track, and it’s a tug of war between two sides to switch the points to Independence or hold them set straight ahead as before down the rails of Dependence. Despite this, Scottish voters are being told it must be Yes, or No. What about those who really can’t work out the pros and cons, who don’t know what to believe, and who can’t do the research or previsualise the possible outcomes? Would they ever do the logical thing and flip and coin to see whether to vote Yes or No? Unlikely. Would they decide to switch the points, to vote Yes, as the default action best taken if uncertain? Even more unlikely. written down to be checked with a cross as the most accurate choice for that voter. 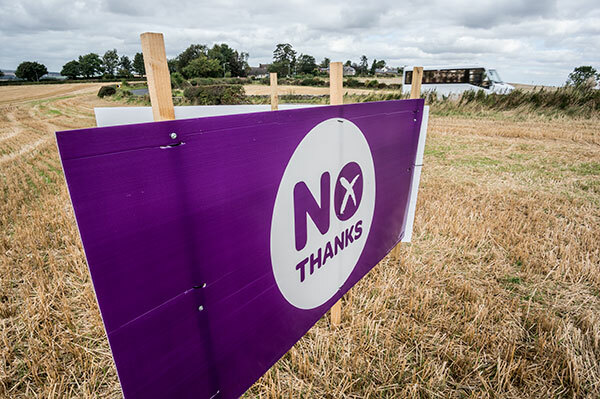 This means that hundreds of thousands, maybe millions, of genuinely undecided and neutral voters will vote No because they mistakenly see this as representing a neutral position. So please, when discussing the vote with people you know are intending to vote No because they ‘have doubts’, suggest that the most honest action to take is NOT TO VOTE AT ALL. A No vote should only be cast if you are actively anti-independence and actively support ultimate government from London via a subordinate Scottish Parliament. Think hard whether your intended ‘No’ vote should instead be simply no voting at all. My feeling is that if you are undecided, doubtful, and uncertain about the future of Scotland you already accept that a majoirty No vote will place that future in the hands of others for generations to come. It will forfeit many key powers to Westminster when these powers could be held, forever, by Scotland. If you are willing to accept this, and understand the limits of Scotland’s influence in future over these powers and decisions, then you should be equally willing to accept the referendum decision made by your neighbours who have done their research, reached their conclusions and have firm positive reasons to vote Yes or No. Do not add your indecision to one side of the referendum only. Do not make your own neutral position turn into a vote. If you are voting with a partner or spouse and you are both equally undecided and unconvinced by either side, do not distort the outcome by donating your vote to ‘Better Together’ by default – at the very least, agree for one to vote Yes, the other No, to reflect your neutrality. Or abstain, like members of a committee who can not agree to support or oppose a motion because they don’t really think the motion is necessary. You have been deprived of the neutral or middle position, Devo Max, by decree of Westminster because they have understood from the outset that an undecided position still held by polling day would normally translate to a No vote and rarely if ever to Yes. If you really do not know, do not vote No. Do not vote at all. This is the one kind of polling where an abstention can actually count. Forget your conditioning that voting is a good thing. It is not a good thing if you vote for one choice simply because it looks like not voting, like ‘no change’. Change is now certain, either way. You can not vote for ‘No Change’ by voting ‘No’. I am not a blogger. I don’t make political posts or comment through my business web pages, or through the insignificant medium of the magazines I publish. That’s more or less saved for Facebook likes and occasional comments on other blogs and websites. You may be able to deduce my views and you may agree or disagree with some of them, but most of the time my political views are not why I’m here and certainly not why I publish. This month, however, there’s something which is bigger than politics although it feels exactly like politics to some people, and that is the Scottish Referendum on Independence. It’s fair to say that even before we moved to Scotland 26 years ago I would have favoured Scottish independence. Now I’m worried that this simply won’t happen, despite a general consensus that the broad political mix presided over by the SNP at Holyrood has proved to be intellectually and morally superior to Westminster’s two houses. I’ve spent time observing the Yes and No campaigns, which voters they affect, and how they affect them. I have friends and neighbours who will vote No, and perhaps rather more who will vote Yes… because so many of my friends are anarchic, exuberant, hopeful dreamers and imaginative thinkers. They are doers, builders, creators and agents of change. They want to live in ‘interesting times’. Independence, if it comes, will energise them whether they are teenagers or pensioners. And these are exactly the kind of people that the No campaign lacks any connection with. 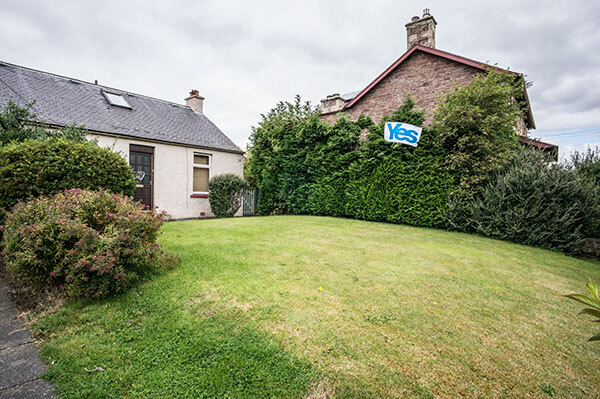 My observation is that the No campaign – if not all No voters, many of whom are merely undecided and apprehensive bystanders – is vehemently conservative, patronising, patriarchal, anti-creative and firmly committed to preserving the status quo. So today I took a small camera out for a short drive. 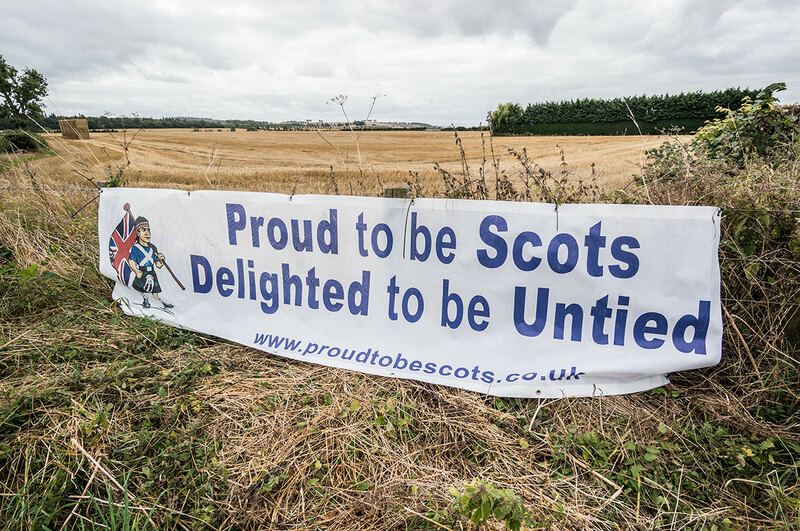 I had seen what I considered to be a most offensive (and equally expensive) weatherproof banner appearing along roads bordering farmland. I wanted to photograph this. It says everything you need to know about how the landowners (mostly sitting in the Westminster House of Lords) and their tenants (unable to hold any opinion of their own) and perhaps their workers (ditto) view Scotland and Scots people. This may be a major graphic design fail, but someone actually had to brief the unfortunate would-be artist on exactly what this strangely mis-shapen and aggressively-puzzled frowning figure should look like. Now I just don’t think I would LIKE the committee, or individual, who instigated and approved this icon for a United Kingdom seen from a (subordinate and maybe subservient?) Scots ‘loyal’ perspective. 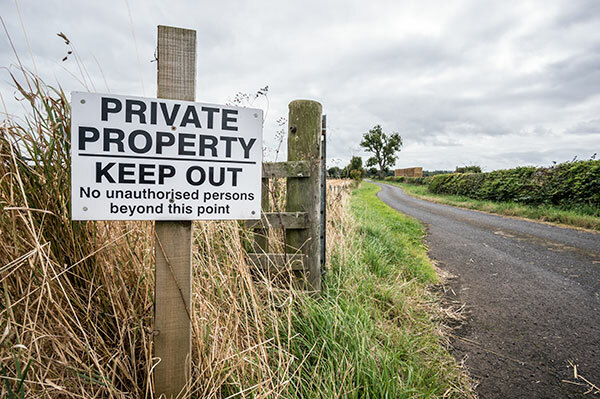 The farming community in the Borders, despite the vast amount it loses under the present handling of EU support through a Westminster government which favours English farming to a manifold degree, is entirely in the pocket of old money and old ideas. Fortunately this is not how most Scots see themselves or their relationship with England, or their part in the UK. I’m sure this particular banner is firming up the resolve of Yes voters. 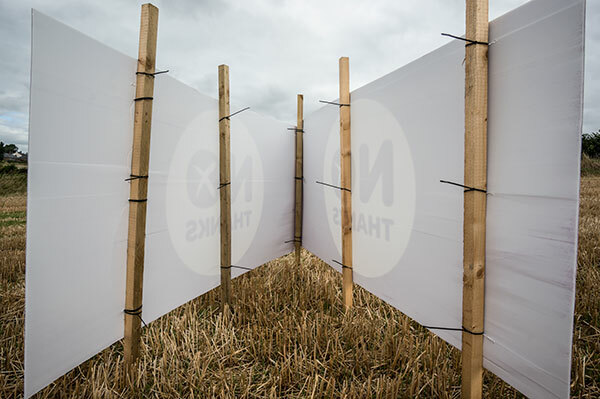 There are many more large placards in farm fields. 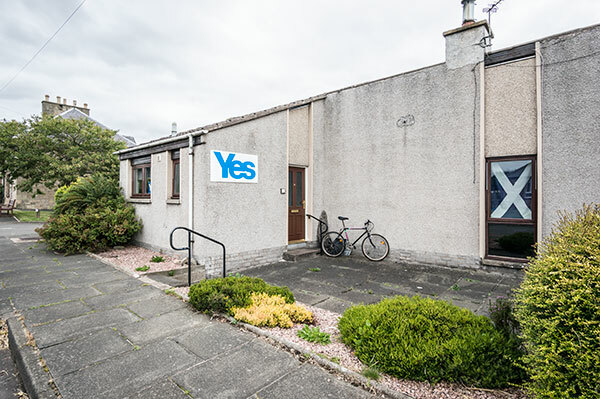 You won’t see many, if any, Yes art-installations (give or take a few badly defaced No examples, which are no credit to the spraypaint skills of the Yes partisans involved). This double poster visible from the passing bus is not a minor undertaking for anyone except a farmer with all the materials, land and labour needed to erect it. This is a pretty substantial temporary advertising hoarding. 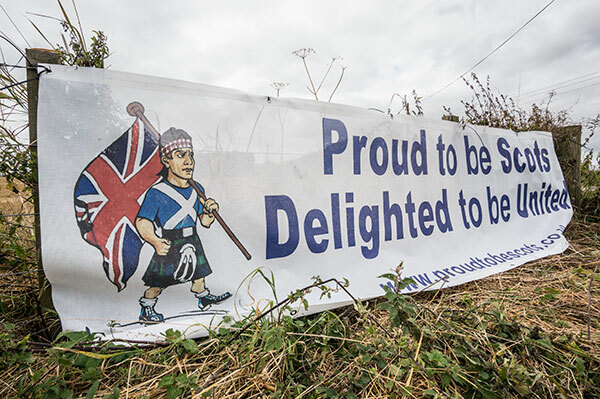 And just down the farm road from the corner where the ‘delighted to be united’ banner is fixed, a little too far away to get into a single image with any effect, is a sign which helps us understand where all this is coming from. In Heiton, there were both Yes and No placards and stickers on display. I was not trying to find just the No posters. 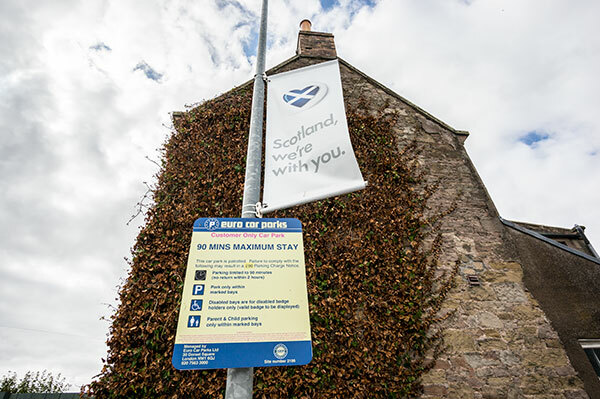 I wanted to see how many Yes and No examples I saw, taking the road to get to this poster (from Kelso through Heiton, Border country not far from England, in an area with a great mixture of locals, Scots from all over Scotland, English and much welcomed folk from Europe and the wider world). 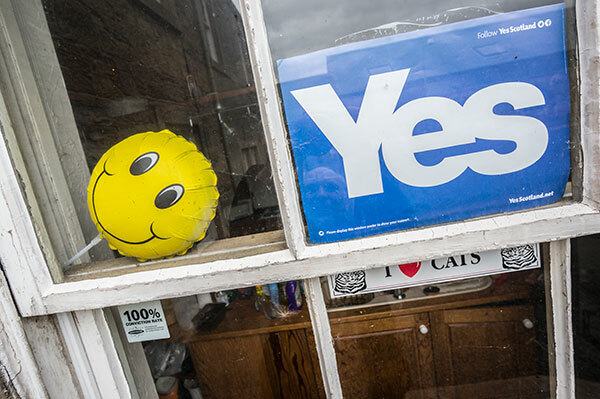 If you think that Yes affirmations are rarely as big as the No campaign, No stickers in windows can be even smaller. I don’t think this is necessarily because the No voters are frightened of a stone through the window or a scratch on the car – certainly no more so than the other way round, and in this civilised patch of Scotland, unlikely. 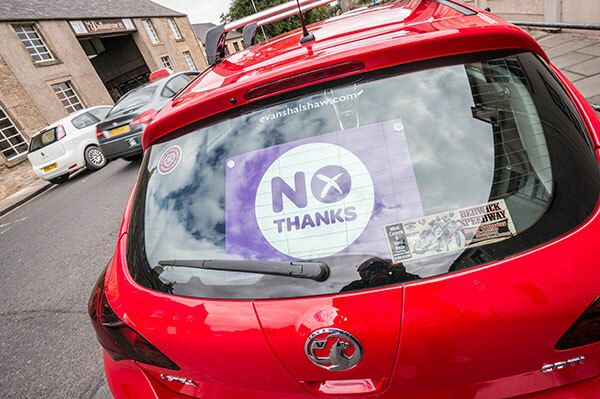 I certainly would not put a Yes (or No) sticker on my car and park it in Edinburgh or Glasgow. That’s a very small No in the house door. In Kelso, that’s a pretty big No in the car window. Hopefully, it’s removed when driving, as it would be terrible for the police to appear to be partisan by asking the driver to stop and remove the obstruction to rear vision! 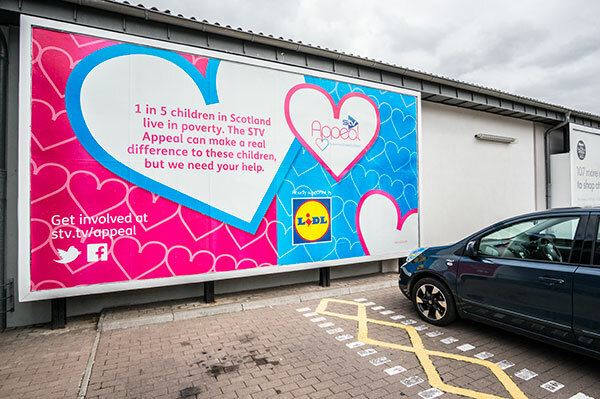 And then we do get subliminal messages – LIDL may be European, but in Scotland, it’s very Scottish (except for the car park fines). You might also suggest that this huge charity sponsorship poster indicates some kind of commitment to social change. It’s good thing that Kelso’s bourgeoisie is just as likely to be found loading the Land Rover at LIDL as at Sainsbury’s. If there’s one thing the Yes/No issue isn’t, it’s a class thing or an income-group thing or a Scoticity (ethnicity…) thing. Except, of course, that small farming issue of lairds, land and labour which appears to distort the balance to anyone driving through the Scottish countryside. But this should not let you think that Scotland is the egalitarian, balanced society some media would have you believe – that a vote for Yes will automatically create some Nordic-style levelling of wealth and opportunity. Near the purple No sign, beyond the Duke of Roxburghe’s eponymous hotel and golf course, lies a ‘village’ created to be permanent or rented mansion-style housing for golfers, called Sunlaws (the old name of the hotel and estate). 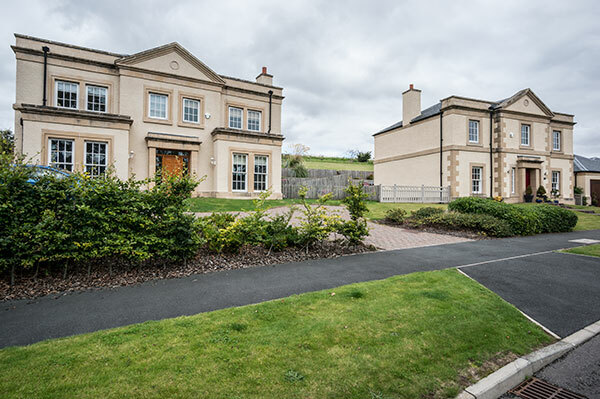 This is a remarkable example of how a local architectural style – the four-square neo-Palladian, post-Adam Georgian villa or farmhouse which Sir Walter Scott so much disliked and thought vulgar and modern back in 1820 – can be used inappropriately. In Scott’s day such houses, which do indeed exist in the Borders in their original form, generally sat alone at the heart of a farm estate, or in gardens in the centre of towns. 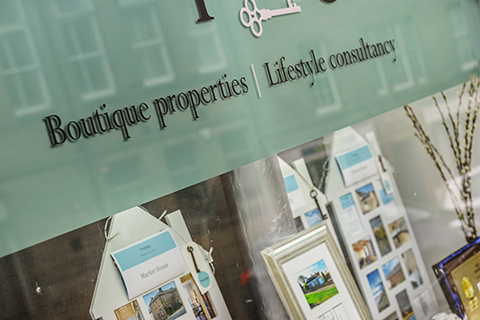 They didn’t sit in groups, even though housing estates and developments were every bit as popular 200 years ago (just look at Edinburgh’s New Town, or any of the Border towns). 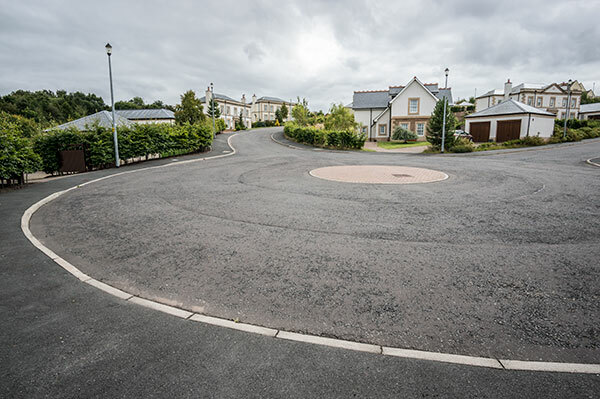 Even the roadway is on an unusual scale, with this three-lane wide turning circle at the foot of the estate. I saw no Yes or No stickers in Sunlaws, just an impressive showcase of executive cars – because this place has no services, no shops, no school, and is totally dependent on car ownership. In contrast, I’ll show you this. 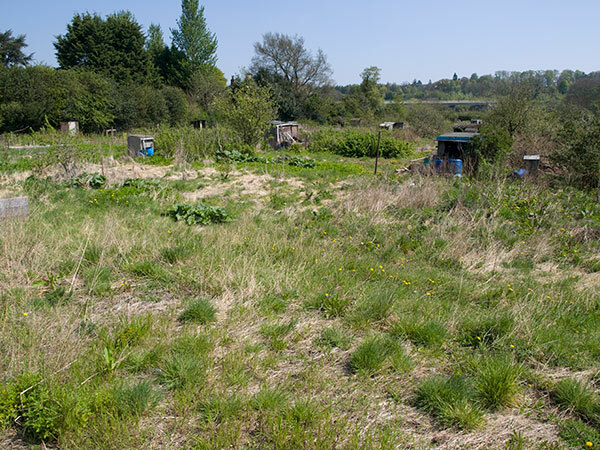 This was the old Kelso allotment, owned by a committee which discovered it was worth enough to fund their pensions comfortably if sold for housing. 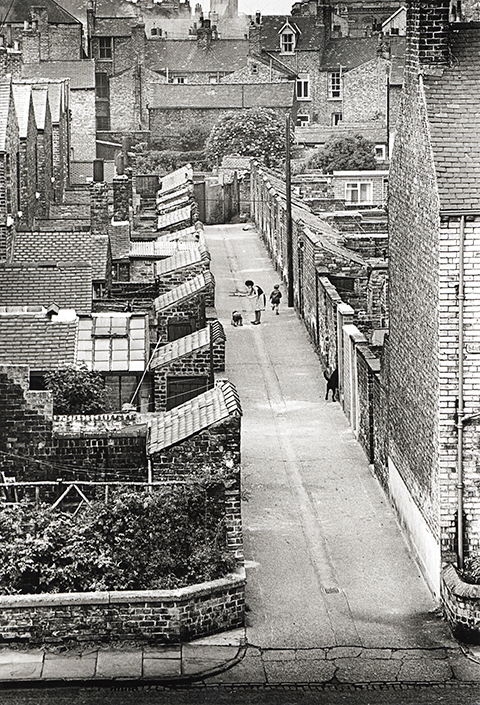 The allotments were behind LIDL – my view is, in effect from where the wooden fence is now. 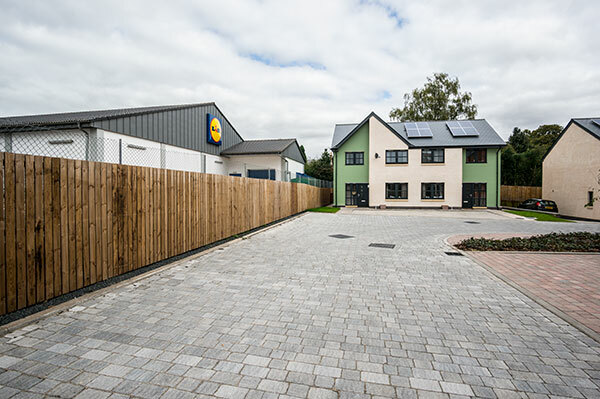 And these houses were finished a few weeks ago, with families moving in just before the schools went back. 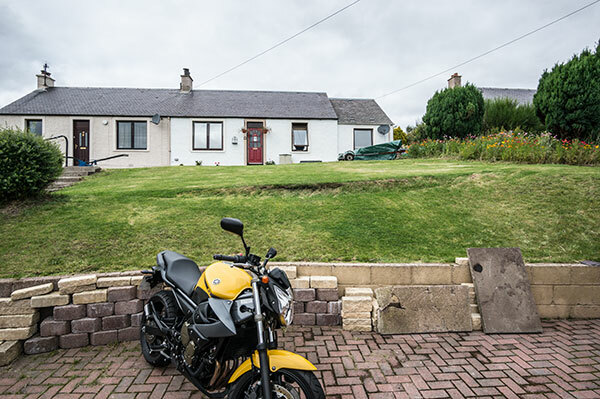 They make an interesting contrast to Sunlaws – in no less attractive a position (the River Tweed is 100 metres beyond the furthest house you see here) but a mix of social rented and affordable private housing. “I’ve been told that single mothers have got the keys to some of them”, an informed local told me. 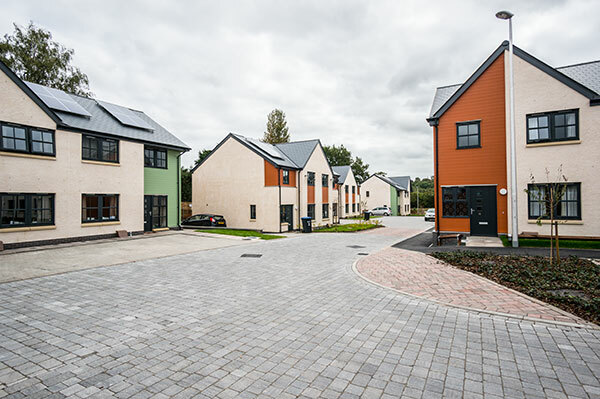 Indeed, they have, and I spoke briefly to one young mum who had just moved in, agreeing on what a lovely place she had been lucky enough to secure, and how much space there was (wide parking drives, and a park-like fallow field left undeveloped). 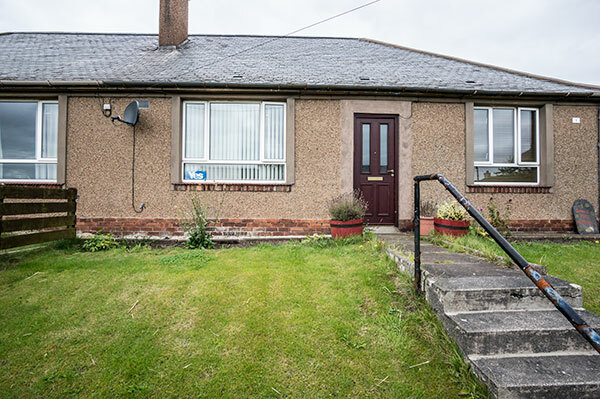 And it’s two minutes to LIDL, three minutes to the town centre, on foot. I saw no Yes or No signs here – but I imagine if you could read the thoughts of the burghers of Sunlaws (who have seen their house prices fall, much the same as at the ‘Disney village’ of Cardrona next to another golf course near Peebles) you’d spot very few Yes flags… and here, probably not that many No banners. As for me, Shirley and the cats we remain optimistic. There’s still a chance of a bright future for Scotland as the Yes campaign remains forward-looking, imaginative and willing to take some risk for the sake of the future. 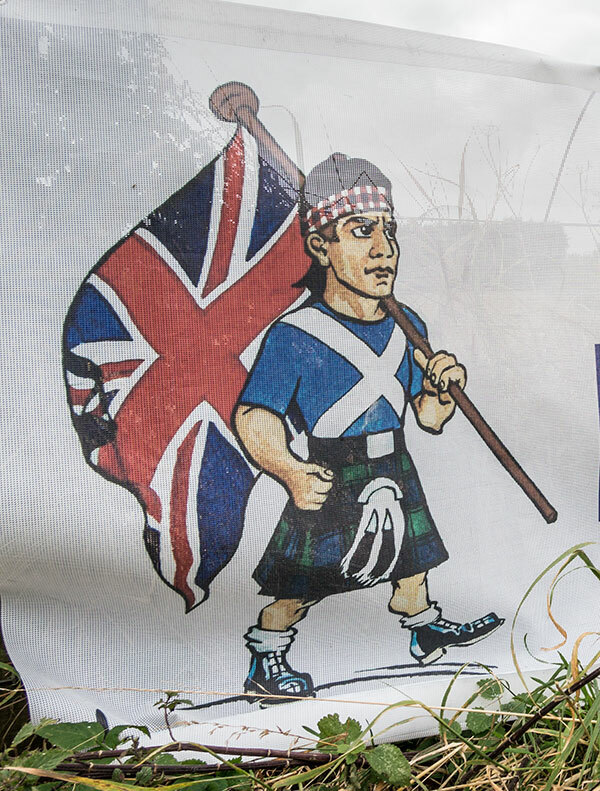 The No campaign continues to rely on fears and doubts, to sow seeds of uncertainty; there is a nasty undercurrent promoting the guilty feeling that if you vot e Yes, you are somehow Against England, or Against the UK, rather than Pro Scotland. It is worth saying that most of this polarisation would have been defused completely by the inclusion of the Devo Max option in the referendum vote. Every conversation I’ve had with supporters of both sides indicates that full devolution without statehood would have attracted a firm majority vote. That option was in effect vetoed by David Cameron in person; divide and rule, rather than face the loss of control over an undivided Scotland. The last word? Well, I couldn’t resist making a small change to that awful ‘delighted to be united’ banner… if only in Photoshop! We shall see, on September 19th, what the outcome has been. I will be very disappointed if Scotland decides it can’t face the future and an intimidated majority turns the nation’s face to the wall to go back to sleep for a few more generations, while her ‘partner’ in the UK sneaks out of the marital bed to fight, gamble and put itself about as usual.